For the millions of fans of Jimmy Buffett's music as well as his bestselling books, Tales From Margaritaville and Where Is Joe Merchant?, here is the ultimate Jimmy Buffett philosophy on life and how to live it. 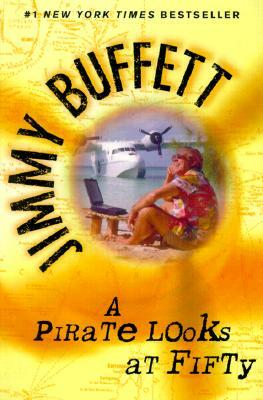 As hard as it is to believe, the irrepressible Jimmy Buffett has hit the half-century mark and, in A PIRATE LOOKS AT 50, he brings us along on the remarkable journey which he took through the Southern hemisphere to celebrate this landmark birthday. Jimmy takes us from the legendary pirate coves of the Florida Keys to the ruins of ancient Cartegena. Along the way, we hear a tale or two of how he got his start in New Orleans, how he discovered his passion for flying planes, and how he almost died in a watery crash in Nantucket harbor. We follow Jimmy to jungle outposts in Costa Rica and on a meandering trip down the Amazon, through hair-raising negotiations with gun-toting customs officials and a 3-year-old aspiring co-pilot. And he is the inimitable Jimmy Buffett through it all. For Parrotheads, for armchair adventurers, and for anyone who appreciates a good yarn and a hearty laugh, here is the ultimate backstage pass -- you'll read the kind of stories Jimmy usually reserves for his closest friends and you'll see a wonderful, wacky life through eyes of the man who's lived it. A PIRATE LOOKS AT 50 is a breath of fresh air and a ingenious manual for getting to 50 . . . and beyond.